This term the science topic for year 3 is light and we were very lucky to have Mr Bee come in with his wonderful light workshop. Class 2 and 4 had a workshop on manipulating light using the iPads and class 1 and 3 had to get dressed up in the finest Victorian clothing and were photographed using a lens over 100 years old! 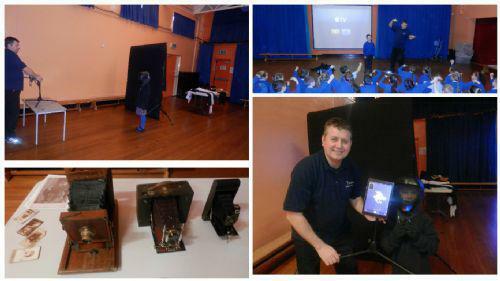 Today we went down to the hall to take part in a light workshop. We met a very interesting man called Mr Bee. We learnt that in Victorian times if you wanted to get a photo taken you had to sit still and not blink for 30 seconds. Mr Bee asked us to do this and only three of us could. You had to do this because if you moved, your picture would be all fuzzy. We learnt that when mothers wanted a picture of their baby they had to put a blanket over them and then put the baby on their knee so that the baby wouldn’t move! When we had our picture taken we had to dress up in all black and put a black mask on. We could choose from green, blue and red lasers and then we were filmed in front of a black screen with the iPads, the colours in the pictures were amazing! It was an outstanding morning. In the light workshop we learnt lots of interesting facts about light and photos. Did you know that the lens we used to take the photos was 136 years old? We all had to get dressed up in Victorian clothes. We found out that astronauts have put a mirror on the moon and in Texas they shoot a light at it and it takes 3 seconds to reflect back. It was an amazing day!